The Chinese press have started doing their own investigations and found that even in 2010, KLIDC had net negative asset values. 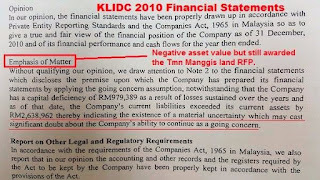 Even in 2010, the auditors even questioned KLIDC and wrote in the accounts that there is significant doubt the company can continue to operate as a going concern - which led to an "Emphasis of Matter" in their accounts - essentially saying the company has negative assets and is technically bankrupt even then. Perhaps Tony Pua can help explain this. 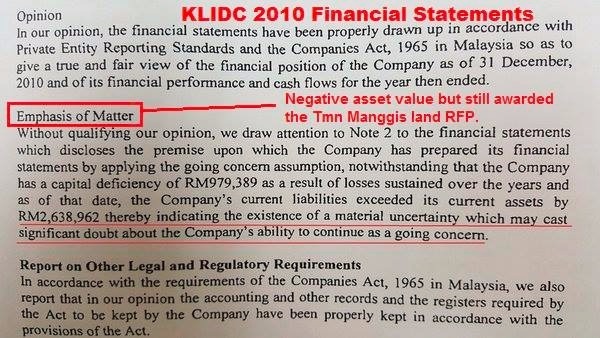 But still, the Penang Govt officially awarded the Taman Manggis PPR land RFP to a technically bankrupt KLIDC in July 2010 - beating out 3 other bidders that soon after the RFP closed, had strangely been dissolved, wound up or liquidated. In fact the Chinese press even pulled out the financial statements for every every from 2010 to 2014 and found that the company have not been financially sound. And worse - from 2013 to 2014, the number of employees dropped from 12 to ZERO. Revenue also dropped to zero. 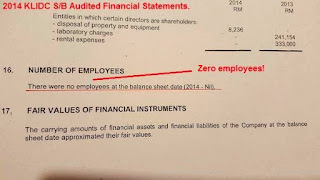 Yes, there were zero employees in KLIDC in 2014. 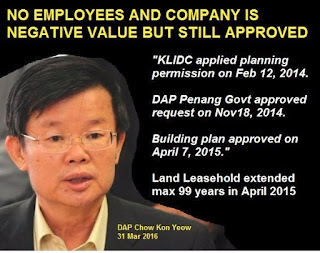 But DAP YB and Penang EXCO Chow Kon Yeow recently confirmed that KLIDC had submitted an application for planning permission on Feb 12, 2014 to build one block of 24-storey building consisting of a hospital, car parks and hotel suites. 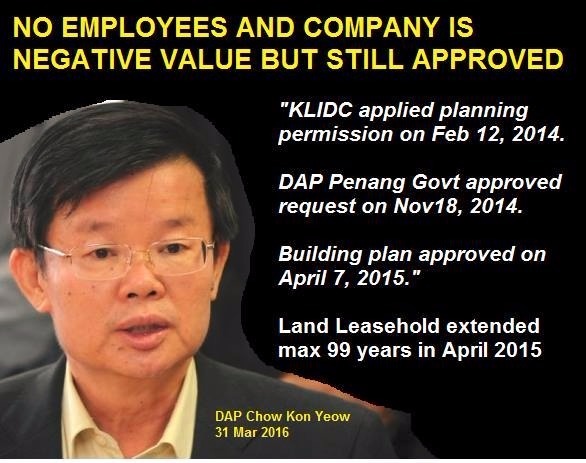 Planning approval was given by the Penang Govt on Nov 18, 2014 and the building plan as approved on April 7, 2015. The leasehold for the Taman Manggis land also got immediately extended to the maximum 99 years term by the Penang Govt in April 2015. Just three months later, LGE officially bought the Pinhorn Road bungalow and put it in his own name at a hugely undervalued price. Wow.. 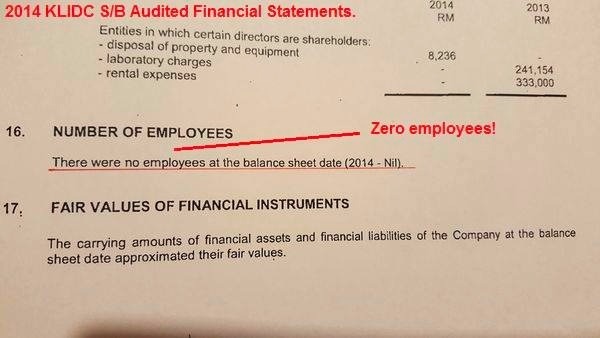 ZERO employees and company is financially not viable in 2014 and the Penang Govt still gave approval ? Who then applied in 2014? Ghosts from Pinhorn road applied? No wonder Raja Bomoh needs to go there urgently. Looks like the DAP Penang Govt and the Chief Minister has lots more new things to explain in this Skandal Banglo LGE. What??? ?....Where is DAP's CAT?? ?....I had a lot of respect on LGE and now!! !....Hopefully this is not true and Penang Govt comes clean on this. Dah terbukti kerajaan penang bawah tokong semua kaki kelentong.. The Fallen Tokong.You win some and you loose some.The later some is something the tokong will rest in peace.Where?Is it Kajang whom an ex MB just being released under payroll and who knows a new ex CM shall be the next candidate.Adios LGE.